The superintendent of Mercedes ISD was chosen as the 2018 Superintendent of the Year for Region One, and now he is a nominee for the same award at the state level by the Texas Association of School Boards, according to a TASB news release issued Friday. Daniel Treviño Jr., a Mercedes native, was selected regional superintendent of the year by a regional selection committee. He was selected from a pool of superintendents across Hidalgo, Starr, Cameron, Willacy, Webb, Zapata and Jim Hogg counties. “The SOTY program has recognized exemplary superintendents for excellence and achievement in educational leadership since 1984,” the release read. The candidates for the award are “chosen for their strong leadership skills, dedication to improving educational quality, ability to build effective employee relations, student performance and commitment to public involvement in education,” the release further read. His nomination sent to the state selection committee, Treviño is now up against nominees from the other 19 regional education service centers for the statewide award for 2018 Superintendent of the Year. Treviño attended Mercedes public schools and earned a bachelor of science in Agricultural Education at Texas A&I University, then returned to Mercedes as a teacher for eight years. In 1994, he completed his masters in educational administration from Texas A&M-Kingsville and was hired as an assistant principal for WB Green Junior High School in La Feria. 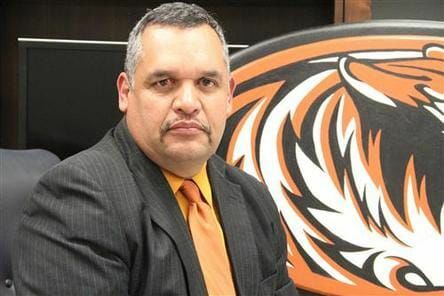 He also spent more than 16 years at La Feria ISD, serving as both assistant principal and principal of La Feria High School, and in 2002 he was chosen as high school principal of the year for Region One. Since then, Treviño served as the assistant superintendent of La Feria ISD and has published work about public education. Treviño will be interviewed with the state committee in Austin in late August to become one of five state finalists. He will find out if he is the TASB 2018 Superintendent of the Year at the organization’s convention in Austin on Sept. 28.